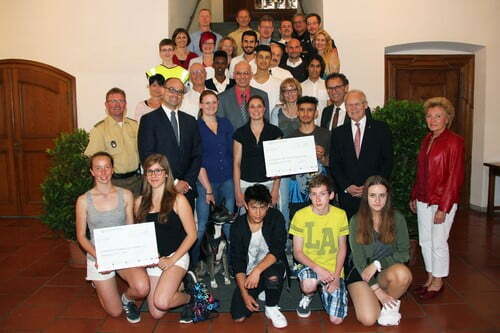 Memmingen Crematorium donated in July 2016 an amunt of 27,000 euros to various projects in Memmingen involved in youthwork, safety and training. Under the watchful eye of Mayor Ivo Holzinger, Stefan van Dorsser, CEO of Memmingen Crematorium, handed over a total of 27,000 euro. Memmingen volunteer fire brigade received a portion of this to buy a number of items which it needed. Also the Förderverein Reichshainschule special-needs school was given a cheque for various things (table football, jungle gym, basketball hoop), and the Zollergraben kindergarten received a cheque to purchase outdoor games equipment. Cheques were also given to other associations in Memmingen and the locality, including the Animal Protection Association, the local Traffic Controllers and the Bismarck school, BBZ vocational training centre and Johann-Bierwirth school. “Since the opening in 2006, Memmingen crematorium has played an important role in the lives of many people in Memmingen and environs”, said Henry Keizer, CEO of ‘the Facultatieve Group’. “Based on this role and our sense of social responsibility, it therefore gives us great pleasure to contribute to these worthy projects that benefit all residents of Memmingen.” The Memmingen Crematorium – part of ‘the Facultatieve Group’ – opened its doors in October 2006 on the Waldfriedhofstraße 4a. With many years of experience and its vast pool of expertise, ‘the Facultatieve Group’ guarantees that funeral ceremonies at Memmingen crematorium are handled with the respect they deserve. Key to this is an optimum service with scope of personal input to fulfil the wishes of the deceased and those they leave behind.